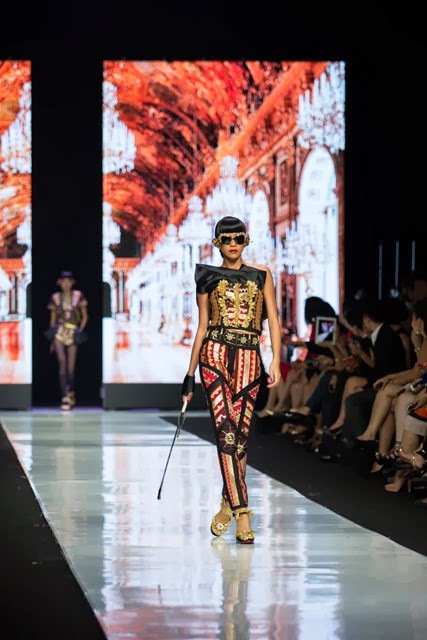 this is my first review of collections from Jakarta Fashion Week 2014. Everything at first! The first from JFW--ever (the event initially held in 2008), the first of its designers showing in Jakarta (Tex Saverio is one of them, but I wrote a review based on his début show in Paris), and the first to feel the long to go to Indonesia and grab everything! I heard about Priyo few years ago from my friend Faozan (who dragged me to my true passion in fashion), and I have been watching him ever since. The Esmod Paris graduate, who later worked at the House of Balenciaga, is one of the most prominent designers in Indonesia. My fave! This jacket is SICK! My very eyes caught the blatant sense of Château de Versailles, the glorification of French luxury and lavishness. And yet, there's something else that bothered my French fantasy. The unique thing about Indonesian designers, as far as my duly observation, is that they always mix something with a very strong scent of local tradition and culture (many use batik patterns *yawn*. With no less than 1.340 ethnic and tribes, there are A LOT to explore, people). 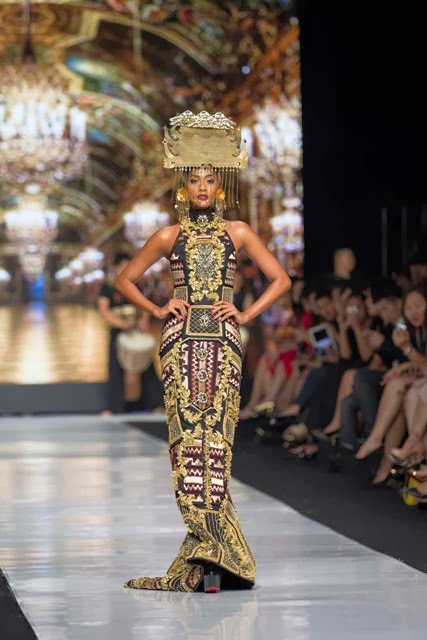 In this case, an interesting one, Priyo Oktaviano brought back the glory of Lampung ancient kingdom (the southern edge of Sumatra island) with its Tapis Lampung, an ethnic sarong-shaped womenswear made ​​from cotton yarn woven with a pattern or decoration, embroidered with thread of silver or gold. Tapis Lampung, which was crafted manually using gedokan and cucuk techniques, techniques to minimize waste and to ensure maximum visibility of the gold, was transformed into the interpretation of the results in the form of fashion glamour and grandeur of the Palace of Versailles. Magnificent palace ceiling, walls full of luxurious and artistic decorative carved wood and ornaments of classic timeless beauty as the Palace of Versailles was translated through stark silhouettes and bold shapes. A touch of dark colours and geometric patterns, each refers to the number of gold ornaments and the pattern of the inner walls of the Palace of Versailles. The details grew richer with lots of ivy leaf-shaped embroidery (prosperity symbol for the people of France) and the beads are shaped like the sun, inspired from the nickname of King Louis XIV as Roi du Soleil. The result? 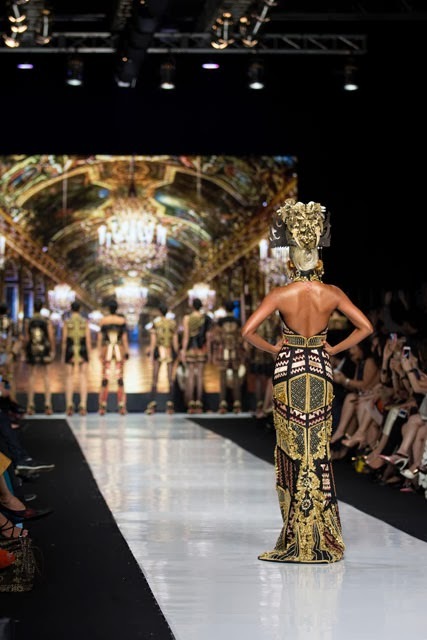 A mesmerizing blend of European exuberance and Indonesian opulence. The fashion galore. Signorfandi, his fashion trajectory is one to watch!